These man-eaters have consumed hundreds of humans and spread terror in their territory for years. There have been instances of leopards eating humans recorded throughout history. The Leopard of Gummalapur was a man-eating leopard that killed at least 42 people in the Devarabetta and Gummalapur villages in southern Karnataka, India. The leopard was active over an area of 250 square miles. The fear of the leopard was so great that villagers would stop going out of their homes after dusk. The leopard did not stop at this and soon started attacking people in their homes. It would tear through the thatched walls of the village homes and drag away people to devour them. On one occasion, it even managed to kill all four members in one home. The leopard was eventually shot down by Kenneth Anderson. He later noted that the leopard had an injury that prevented it from hunting its natural prey. A pair of man-eating royal Bengal tigers, the Tigers of Chowgarh were held responsible for the killing of more than 50 people in eastern Kumaon, India in the early 20th century. The tiger pair consisted of a mother and her sub-adult cub. They had a territory spanning 1,500 square miles. Initially, the tigress would hunt alone but was later joint by her cub. Both the tigers were shot dead by the legendary hunter and wildlife author, Jim Corbett. The Beast of Gévaudan refers to a man-eating gray wolf that terrorized the former French province of Gévaudan killing a large number of people in the region with the first attack taking place in 1764. The attacks of the wolf covered an area of 90 by 80 km. According to some claims, there more than one wolf were involved in the attacks. Eyewitnesses claimed that the animal had immense size with formidable teeth and a long tail. It was also said that the wolf had red fur with black stripes on the back. The man-eater would tear the throat of the human victims and then devour them. According to estimates, the Beast of Gévaudan attacked about 210 people which resulted in 113 fatalities. The news of the killings soon reached the ears of the King Louis XV who dispatched several of his best warriors and huntsmen to hunt down the wolf. Several wolves were killed during this time due to mistaken identity but the killings continued to occur. Finally, it was a local hunter named Jean Chastel who managed to shoot the Beast of Gévaudan using a blessed bullet he had himself manufactured. The wolf’s stomach revealed human remains. The Leopard of Rudraprayag is another man-eater from India that is famous for its association with the famous hunter and author Jim Corbett. The leopard’s first human kill happened in 1918 in the Benji Village. After this, the leopard developed a liking for human blood and for the next 8 years, went on to spread terror in the lives of people living in its range. The fear of the Leopard of Rudraprayag was so great that even devout Hindu pilgrims dared not to visit the Hindu shrines of Kedarnath and Badrinath since the road to these shrines passed through the leopard’s territory. Nothing could stop the Leopard of Rudraprayag. It would break through doors, climb through windows, and claw through the thatch and mud walls of the village homes to get its human victim by the neck. Official records mention that the leopard killed more than 125 people but Corbett reports a higher number of deaths. Soldiers were employed to track and kill the leopard but all failed. Ultimately, on May 2, 1926, Jim Corbett, after a 10-week hunt, killed the man-eater. According to Corbett, the leopard killed since it had developed a taste for human flesh. A pair of man-eating lions, the Tsavo lions, spread terror in 1898 when they killed and consumed a large number of construction workers who were employed to build the Kenya-Uganda Railway. In March 1898, the British started the project of building a railway bridge over Kenya’s Tsavo River. A large number of Indian and local workers were employed to complete the project and they settled in a campsite near the project site. During the next nine months, two maneless male lions haunted the campsite where at night they would drag workers out of their tents and devour them. Several measures were adopted to keep the lions at bay but to no avail. Many workers fled the campsite to save themselves from becoming lion prey. John Henry Patterson, the British officer in charge of the project, tried several times to kill the lions. After many failed attempts, he was able to shoot the first lion on December 9, 1898. The second lion was killed 20 days later. During their reign of terror, Patterson claimed that the lion pair killed about 135 people. 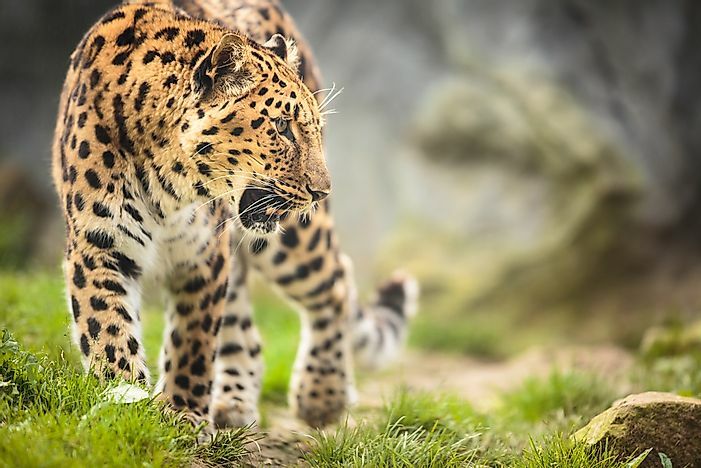 The Leopard of the Central Provinces, nicknamed the “Devilish Cunning Panther”, is an infamous leopard that over the course of only a couple of years in the early 20th century, killed more than 150 people. What was even more shocking was that all the victims of the leopard were either women or children. The leopard had its territory in the Central Provinces of British India. During its peak active time, it claimed the life of one human victim every 2 to 3 days. Every time the killing occurred in a new area. The leopard spread so much panic in its range that people stopped leaving their homes alone or without arms. The leopard was eventually killed by a projectile propelled from a gas pipe. The evaluation of the stomach contents of the leopard revealed a ball of human hair, confirming it as a man-eater. Also, since the leopard appeared to be in good health before death and was quite young, it was estimated that it was a man-eater out of choice rather than out of necessity. It was probably taught to hunt humans as a cub by its mother, a likely man-eater herself. A large male Nile crocodile from Burundi, Gustave is a notorious man-eater. The single crocodile is accused of the death of at least 300 humans. Most of his human killings have occurred at the banks of the Ruzizi River and in the northern shores of the Lake Tanganyika. The people of the region are terrified of him and he has obtained a near mythical status there. The crocodile was the central character of the documentary Capturing the Killer Croc that was aired on PBS in 2004. The documentary revolved around the study of Gustave and attempts to capture him. Although he was never caught, his length, according to reports by witnesses is around 18 to 25 feet. Several attempts were made to capture this killer croc but none succeeded. The last possible sighting of Gustave was reported in June 2015. A male leopard labeled as the Leopard of Panar was held responsible for at least 400 fatal attacks on humans in India in the early 20th century. Most of the kills by this man-eating leopard occurred in the Panar region of northern India’s Almora district. In 1907, when Jim Corbett was busy hunting down the fierce Champawat tiger, he came to know of the Leopard of Panar. In 1910, Corbett set out to kill the leopard. Even though the Leopard of Panar claimed more human lives than the Rudraprayag man-eater, another man-eating leopard active in northern India during that time, the British Indian press paid less attention to the former, possibly attributed to the remoteness of Almora where the leopard was active. A female Bengal tiger went down in history as the man-eating Champawat Tiger with 436 human deaths associated with her. The tigress’ exploits have been recorded in the Guinness Book of World Records as the tiger responsible for the highest number of human fatalities. Her attacks first began during the late 19th century in a region in Nepal. She began hunting down humans by the dozens. When hunters and armed forces failed to kill her, people almost gave up hope. Finally, the Nepalese army managed to drive her across the border into India. The tigress was not to be subdued in her new habitat and continued to prey upon humans in the Kumaon District of India. She now became bolder and started hunting people in broad daylight and was often sighted prowling around villages in the area. Life nearly stopped in these villages as no one dared to venture out of the safety of their homes for work. Finally, the famed hunter, Jim Corbett, managed to shoot the Champawat Tiger in 1907 after she had claimed nearly 436 human lives. Recorded as the "worst crocodile disaster in the world” by the Guinness Book of World Records, the Battle of Ramree Island is said to be associated with the death of hundreds of Japanese soldiers in the jaws of saltwater crocodiles. The battle took place during World War II in January and February 1945. The island involved in the battle lies off the coast of Burma. In 1942, the island was captured and occupied by the Imperial Japanese army. In January 1945, the Allies tried to retake Ramree Island to establish airbases on the island. According to some accounts of the soldiers associated with the Battle of Ramree Island including the naturalist Bruce Stanley Wright, crocodiles residing in the island’s mangrove swamps ate many Japanese soldiers at night creating a scene of horror hard to imagine. There are, however, claims by other scientists and historians that the report is only an urban myth.